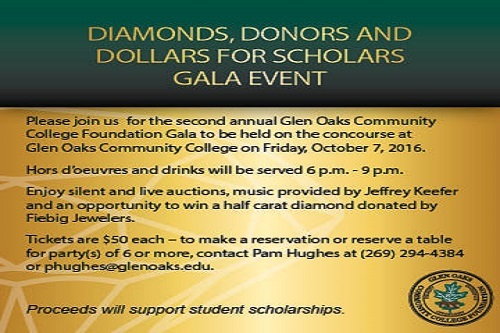 The Glen Oaks Community College Foundation is busy planning for the Second Annual Gala “Diamonds, Donors and Dollars for Scholars,” to be held on Friday, Oct 7 at 6 p.m. on the concourse at the college. The public is invited to join alumni and friends of the college to this extravaganza. “Last year the event raised over $18,000 for scholarships,” said Pam Hughes, executive director of the Glen Oaks Foundation. Hors d’ oeuvres and drinks will be served from 6 p.m. to 9 p.m. Guests will have the opportunity to participate in a silent/live auction and win a half-carat diamond by Fiebig Jewelers. Highlighted auction items include a week’s stay at a cabin on Diamond Lake, a fishing charter on Lake Michigan and tuition and fees to apply toward an associate degree. Tickets are $50 per person. Reserved tables are available for party(s) of six or more. 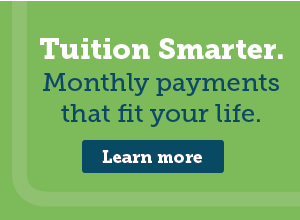 Call Pam Hughes at (269) 294-4384 for more information.